Trim any roots form the onions and cut them lengthwise in half. Remove and discard the outer layer of peel. Cut a V in the bottoms of the onions and remove the roots. Place the onions cut side down on a cutting board and slice lengthwise into 1/8-inch slices, following the natural lines on the outside of the onion. Cutting with the lines, of the grain, rather than against them will help the onions soften more quickly. 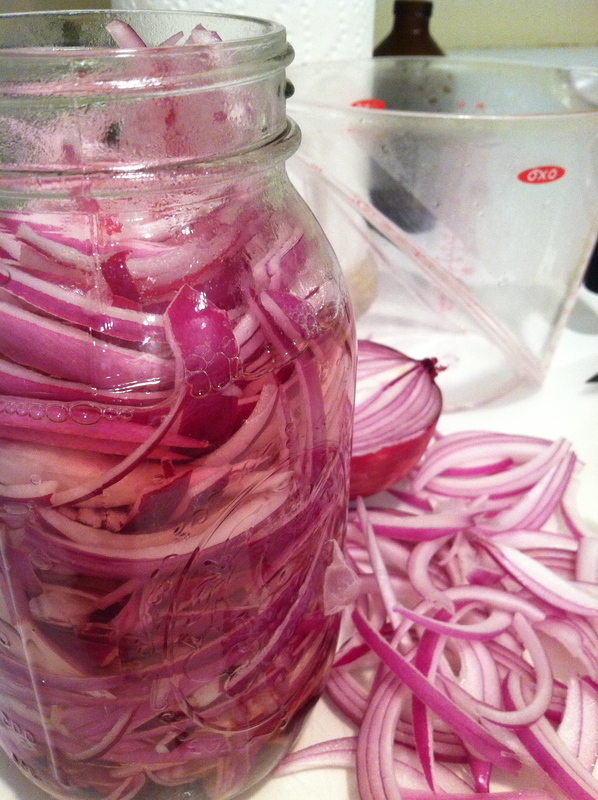 Pack the onions into a 1 quart canning jar or container; reserve any that don’t fit. Combine the vinegar and sugar in a small saucepan and bring to a boil, stirring to dissolve the sugar. Pour the hot vinegar mixture over the onions. Once the onions begin to wilt, you can add any remaining onions to the jar. Let cool. Refrigerate for at least 24 hours, or up to several weeks. Enjoy! This recipe is from Thomas Keller’s Ad Hoc at Home cookbook (which we love).